The polished Larimar jewel looks like a bit of the sky. It is an exceedingly rare variety of pectolite, a usually white or gray mineral of hydrous sodium calcium silicate that is very common and of interest only to mineral hounds. What sets the gem apart, besides its trademarked name, is that it is only found in the Dominican Republic. What gives this gem its beautiful blue coloring which is sometimes interspersed among cloudy white is that the calcium silicate is replaced by inclusions of copper. There are often other “accessories” or “accidentals,” such as hematite, iron, potassium and calcite in the stone. This article will focus on how the gem was discovered, its physical properties and where it can be bought. Though the gem was first “discovered” in 1916 by Father Miguel Domingo Fuertes Loren and then rediscovered by Dominican native Miguel Méndez and Norman Rilling, a Peace Corps worker in 1974, it has no doubt been known of by Dominicans for centuries. At first, the gem was given the name Travelina, then its name was changed into a portmanteau of Méndez’s daughter Larissa and the Spanish word for sea, which is “mar.” The two men found the blue gem on the beach at the edge of the Bahorco Range in the province of Barahona. Most specimens are found in the mines of Los Chupaderos, about six miles southwest of Barahona, in an area of tropical rain forests. Other names for the jewel are Dolphin Stone, Blue Pectolite, Stefilia’s Stone, Caribbean Stone and Atlantis Stone, as the Dominican Republic is supposed to be in the area of the legendary city of Atlantis. The gem is pushed up from the bowels of the earth through volcanic tubes and chimneys by hot gasses. Though this makes mining for the gem challenging, crystals can sometimes be found on the beaches, having been washed down to the shore by the Bahoruco River. 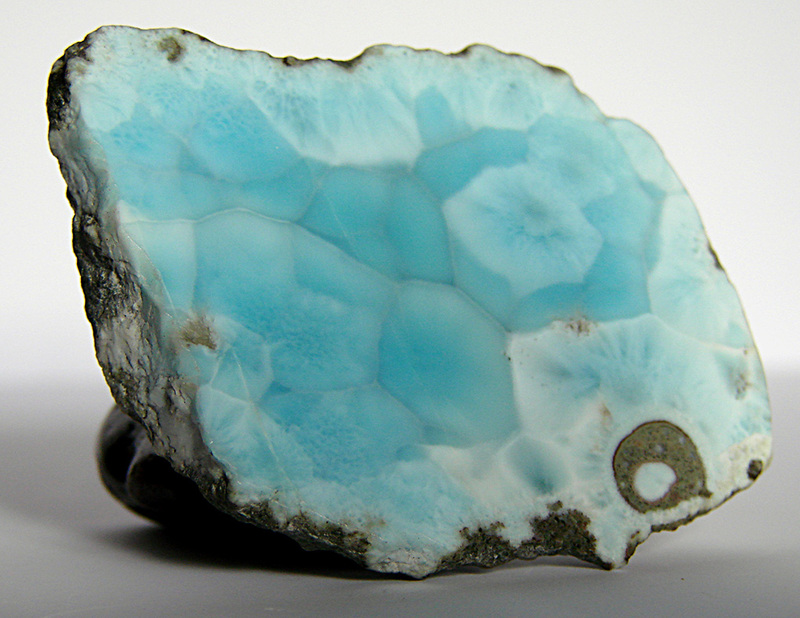 Like other pectolites, Larimar has a triclinic crystal system, which means it has three oblique axes of unequal length. The crystals are needle-shaped under magnification. Its chemical formula is NaCa2Si3O8(OH), and it rates 4.5 to 5 on the Mohs hardness scale. Some examples of the gem rate a 6 if they are unusually fibrous. The refractive index, which measures the angle of the light as it penetrates the crystal, is between 1.59 to 1.65 and its birefringence is 0.038. The density is 2.70 to 2.90, and it has perfect cleavage, which means it breaks cleanly along at least one plane. When it’s polished, it has a silky luster and its transparency ranges from translucent, which means it allows light to pass through it, to opaque. It has a weak greenish glow under ultraviolet light. The color of the gem ranges from white, which is the least sought after, to many shades of blue to multicolored. The color is so distinct that it is difficult to mistake the gem for any other gemstone. Only turquoise could possibly be taken for Larimar. Besides common pectolite, there aren’t many minerals that are even in the same family. The beautiful, calm blue of the gem makes it a stone that is concerned with the spiritual life. It radiates peace, love and tranquility and induces in the wearer a deep state of meditation. It raises consciousness, harmonizes the body with the soul and helps the soul find its true pathway. Crystal healers use the stone to facilitate contact with angels and other evolved beings. It is also a good stone to have for people seeking a soulmate and heals past-life traumas. This beautiful jewel removes self-imposed limitations and takes away fear, guilt and self-sabotaging behaviors. It allows the wearer to face challenging times with peace of mind and equanimity. The gem is an antidote to emotional extremes while allowing childlike joy and spontaneity. It is especially useful or women, for it helps them get in touch with their femininity and nature. When it is placed over the heart, solar plexus, third eye or stroked over the skin, it stimulates the third eye, crown, throat and heart chakras and helps in self-healing. It eases conditions of the cartilage and the throat and removes energy blockages in the upper body. If it is laid on a painful area, it will gently draw out the pain. Though the gem probably hasn’t been around long enough for a specimen to become as famous as the Hope diamond or the Black Prince’s ruby, craftsmen in the Dominican Republic and elsewhere know how to set it to bring out its beauty. Like turquoise, the gem is often set in silver. An exceptional stone is set in gold. It then and can be paired with emeralds, diamonds or other gems. Most of the crystals are polished into cabochons. Some show cat’s eye effects from where the light plays upon the needles of the mineral. There are also examples of faceted stones. Other than this, the gems do not need to be heated or adulterated in any way to bring out their splendor. Unlike most jewels, you can find the gem almost exclusively in one country – the Dominican Republic. Occasionally, a person walking along the beach where the Bahoruco River empties into the Caribbean Sea may find a stone. These stones can also be bought on-line at surprisingly reasonable prices. Larimar is a soft stone and needs to be handled with care. It is brittle and should not be cleaned with harsh cleansers, which can corrode it. It should also not be exposed to powerful heat or sunlight, which can bleach it. To clean the stone, use a soft, clean cloth dampened with warm water and mild soap, and rinse it thoroughly. Store it in a felt lined box or cloth bag to protect it from chipping. There is no gemstone like Larimar. Nothing approaches the richness of its azure blues or its silky luster. Necklaces, bracelets, rings, and earrings are now waiting for you to buy them on-line from the comfort of your home. Hey Buddy!, I found this information for you: "Larimar: The Azure Blue of the Sky Made into a Brilliant Gem". Here is the website link: https://accessgems.com/larimar/. Thank you.